Are you looking for a low cost Villa or holiday Apartment in Tuscany? We have selected some low cost villas and apartments in order to give everyone the opportunity to discover how beautiful is spending a holiday in the Tuscan countryside. This does not mean that you will have to give up comfort and quality, because all the listed properties have a fully equipped kitchen, a swimming pool and an outdoor area where you can eat and relax in peace. Many of them also have free Wi-Fi. A holiday in a villa in Tuscany is right for everyone, and below you find some of our best offers for holidays starting from 3 nights rental. 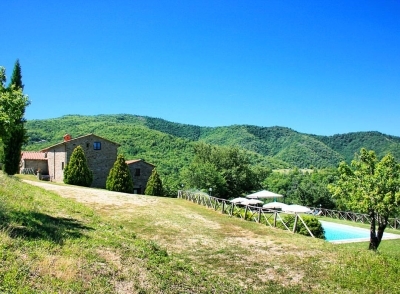 Panoramic and quiet farmhouse, about 15 km from the Etruscan town of Cortona. Due to its secluded location it is ideal for nature lovers. Fully equipped with: dishwasher, washing machine, satellite TV, oven, toaster, juicer, CD and DVD player, coffee maker, blender, table tennis table, wi-fi. Placed in the area of the picturesque town of Anghiari (Arezzo), it can boast satellite TV, wi-fi, a small gym and all the comforts for a pleasant stay. The villa is completely fenced, ideal for those who want to bring a pet. Just 8 km from the Etruscan town of Cortona (Arezzo), it is a well restored farmhouse with all the comforts. You can also taste and buy the excellent wine of the farm of the owners. Cottage country near Foiano della Chiana (Arezzo). Ideal for travel and visit all of central Italy, because of the strategic location. Pets are welcome. Panoramic, quiet and ideal for visiting Tuscany and the coast (the sea is only 50km). private pool, free wi-fi and satellite TV available. Volterra and the Val d'Orcia are waiting for you. - VILLA IL CEDRO Sleeps 10, from Euro 93,00 per night. Pool and private garden, air conditioning in living room and all the comforts. This villa is located between Tuscany and Umbria in a panoramic location and perfect for those who love to move around and visit places during their stay. Old stone farmhouse with private pool, tennis court, satellite TV, wi-fi, barbecue, table tennis, boules, children's playground, fishing pond. 25 km from Cortona. - CASA LA PRIMULA Sleeps 9, starting from Euro 123,00 per night. Ideal for nature lovers and those who love to find a house to rest and spend a holiday. Pet friendly, wi-fi and satellite TV available. The Etruscan town of Cortona is approximately 25 km far. 6 apartments in this old farmhouse in the Cortona area. Large swimming pool and outdoor space to enjoy the Tuscan countryside. Stays from Euro 38,00 / night in a 2 people apartment. 5 comfortable apartments with air conditioning and wi-fi. Large green garden to relax or have fun with family or friends. Cortona is a 10-minute drive. Stays starting from Euro 50,00 / night in a 4 people apartment. 5 Tuscan apartments in a farmhouse near Cortona. Ideal for those who like to move around and visit the Center Italy. info@eurocasa.com - tel. (0039) 0575 845348 – (0039) 335 760 4638.